👑SIGNED AND NUMBERED POSTERS REDEEMED: 339/500👑 “𝘐 𝘸𝘢𝘯𝘵 𝘳𝘦𝘷𝘦𝘯𝘨𝘦." 𝘚𝘩𝘦 𝘸𝘩𝘪𝘴𝘱𝘦𝘳𝘴, 𝘢𝘯𝘥 𝘩𝘦𝘳 𝘧𝘪𝘯𝘨𝘦𝘳𝘴 𝘵𝘳𝘢𝘪𝘭 𝘣𝘭𝘰𝘰𝘥𝘺 𝘴𝘵𝘳𝘦𝘢𝘬𝘴 𝘥𝘰𝘸𝘯 𝘕𝘢𝘵𝘢𝘭𝘪𝘢'𝘴 𝘢𝘳𝘮𝘴. "𝘈𝘯𝘥 𝘵𝘩𝘦𝘯 𝘐 𝘸𝘢𝘯𝘵 𝘮𝘺 𝘤𝘳𝘰𝘸𝘯.” ATTENTION BOOKWORMS! 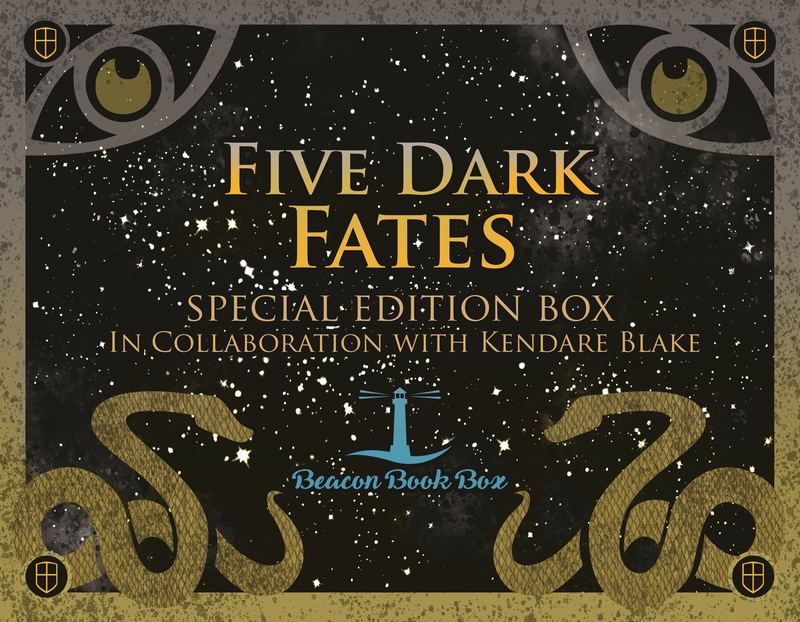 It is time to announce that our next Fall Special Edition box will be for the release of FIVE DARK FATES by Kendare Blake! Before we dive into the details, we are thrilled to reveal that Kendare will be DIRECTLY COLLABORATING with us on this box! This box is a must-have for every Three Dark Crowns fan! ☺️ 👑 Have you been eagerly waiting for the final installation in the Three Dark Crowns series? Wondering what will be the fate of your dearly beloved characters? Kendare Blake has thrown many unseen plot twists at us readers throughout the series and our box is here to assist her fans with diving back into the blood-stricken world of Fennbirn. 👑 This box will be packed full of so many incredible, usable and EXCLUSIVE items, all with Kendare’s stamp of approval. That is right, Team Beacon has been working directly with Kendare on this box and she has selected some items that are truly fit for royals. 👑 You can expect to see nothing but high-quality items that fans of this series will go crazy for. To start the reveals off for this box, the first 500 Complete boxes will receive a SIGNED AND NUMBERED POSTER featuring exclusive artwork that will be to die for 😍. We will also reveal that a BLANKET and ENAMEL PIN will be amongst the high-quality items that will be in this box. 👑 With items being inspired by your favorite characters, events, locations and quotes, this box will be a Three Dark Crowns fans’ dream come true! 👑 We are so excited to announce that our copies of FIVE DARK FATES will be SIGNED by Kendare herself 😱😱. Are you screaming? We are!! 👑 We are also thrilled to reveal that Kendare will be providing EXCLUSIVE BONUS MATERIAL for our box! 😱😍 👑 We will be working with some amazing small businesses and artists that are Kendare approved to make this box extra special. 👑 Please note that this box is a special edition box and is not one of our monthly boxes. Boxes will ship around the book’s release date, September 3rd.